Medieval Wearable Knight Gothic Full Suit of Armor 15th Century Body Armour. Size - 6 FEET Fully wearable armor In Chrome Finish Made Of Good Quality Steel 18 gauge Steel. 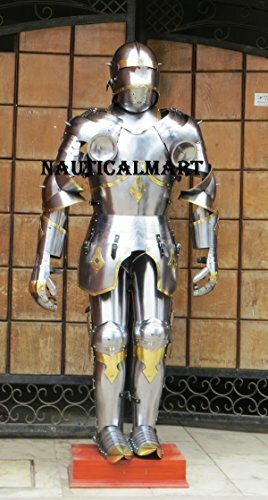 MANUFACTURED & SOLD BY NAUTICALMART INC.
Great for LARP (live action role playing),cosplay, Halloween, fancy dress, theatrical props, and historical reenactments.